Proteins are dynamic and constantly changing their shape. This flexibility not only presents a challenge to to structure-based drug design approaches but also opportunities for the design of specific compounds with suitable kinetic properties. We are developing methods to model and simulate protein and ligand dynamics in order to identify transient binding pockets in proteins and to compute the kinetics of drug binding. TRAPP is a Tool for Analysis of Transient Binding Pockets in Proteins. 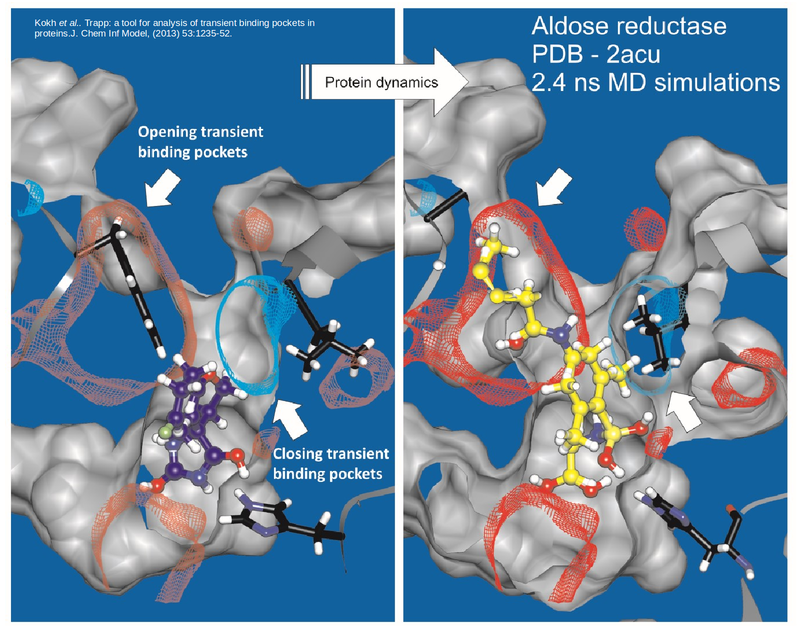 It automates the tracking, analysis, and visualization of binding pocket variations along a protein motion trajectory or within an ensemble of protein structures. TRAPP thus enables an assessment of the druggability of a disease-related target protein taking its flexibility into account. See Kokh et al, J. Chem. Inf. Model., 2013. To efficiently generate protein conformations that reveal transient pockets, we are developing two methods based on the Rotationally-induced perturbation (RIP) simulation method: L-RIP and RIPlig (Kokh et al., in prep). The importance of binding kinetics for drug discovery has recently become appreciated. In the K4DD IMI project, we are developing methods to simulated protein-drug binding and unbinding processes and to predict the corresponding on-rates and off-rates. We apply computational methods to challenging drug discovery problems. For example, in the NMTRypI New Medicines for Trypanosomal Infections EU project, the goal is to develop new candidate drugs against neglected parasitic diseases such as leishmaniasis.